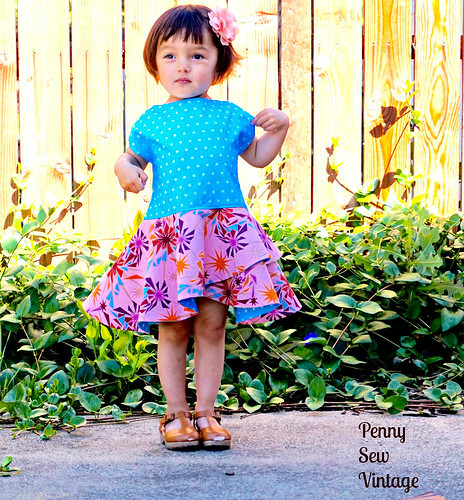 Right now my little one is all about the ruffles, twirling, and anything frilly. 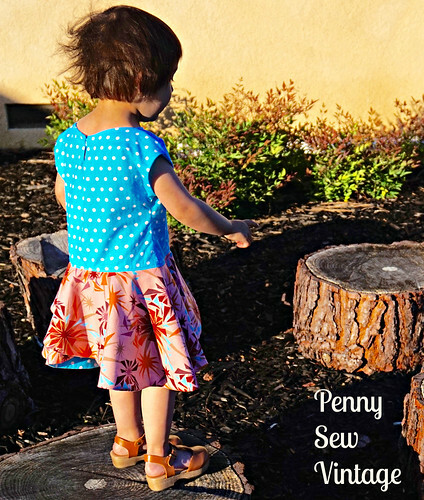 I’m not really that kind of girl, but, as a doting mother that gives her girls everything and anything they want (I make them think so at least), I jumped on the opportunity to test the most twirly dress ever! 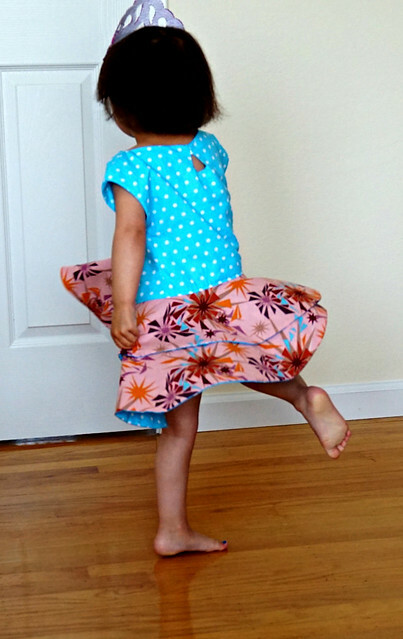 The Crossover Flounce Dress by Designs by Call Ajaire has some amazing twirl, and that’s the way it was sold to me as a tester. I’ve come to find that testing patterns is a lot of work, not just a way to get free patterns. I have to really like the dress before I’m willing to put the time in to test it. Seriously folks, it takes time from sewing stuff for myself! The final dress was imagined. One of the issues is my little one has a rather sizable head, at the time of testing 20.5″, and this dress is meant as a pullover, reversible dress. I couldn’t get the first couple of dresses over her head without adding a closure, so the lovely, patient, and talented Adaire added a genius closure. This optional closure is a keyhole cutout with hidden elastic at the top that is not only easy to put in, but amazing in that my little one can still dress herself (very important at 2 years old). The optional closure is really only meant for the smaller sizes, but for the big kid heads that are proportional to their bodies, the boatneck opening is sufficient to pull the dress on. 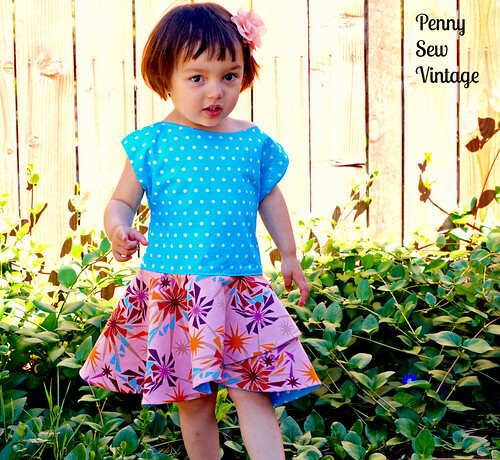 The reversible design is great, 2 dresses in one! My older girlie said (the wearable muslin) was her favorite dress EVER, simply because she’s wearing 2 dresses at a time and they both twirl. 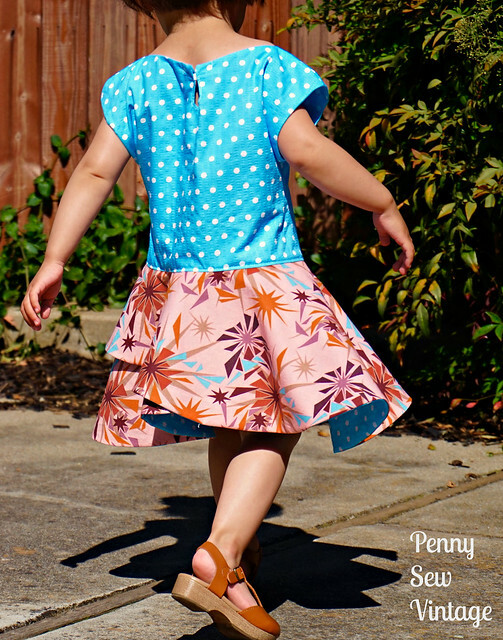 My little one picked out her own fabric for her twirly dress though, with one side all blue with white polka dots. Assembling the dress is very simple, and the instructions are clear and easy to understand. I really like that it looks like a polished pattern and not a blog-tutorial-gone-pattern (I’ve recently purchased some of those because the finished product is cute, but the pattern was lacking that professional touch). The pattern was released this week in the e-zine One Thimble, but I see you can also find it here on Call Ajaire. The current issue of One Thimble has an urban theme, which I totally didn’t see this dress as, but they pulled it off! I think there’s more versatility to this dress pattern that I thought! I was thinking it would be cute with a neon stretch lace layered over the bodice, as the boatneck’s shoulder sometimes slips off and reminds me of the 80’s. Maybe throw in some lace fingerless gloves! Anyway, my girls love these dresses because they’re not only twirly, but they’re also very comfortable for their active lifestyles. I love it because it’s so easy to yell at them to get themselves dressed, and they actually do! A busy mama’s gotta love that! My pleasure! We love it! That’s a beautiful dress. and yes, testing is a lot of work, bu it is a learning process too. I love it. So do I, plus it makes me focus on a project and not get distracted! I always learn some new little technique or way of doing something, either from the pattern itself or the other testers. It’s a great experience!